Less expensive, more environmentally friendly, easier to maintain and long lasting... why would you even consider another pavement? It’s no secret that increased competition lowers costs. 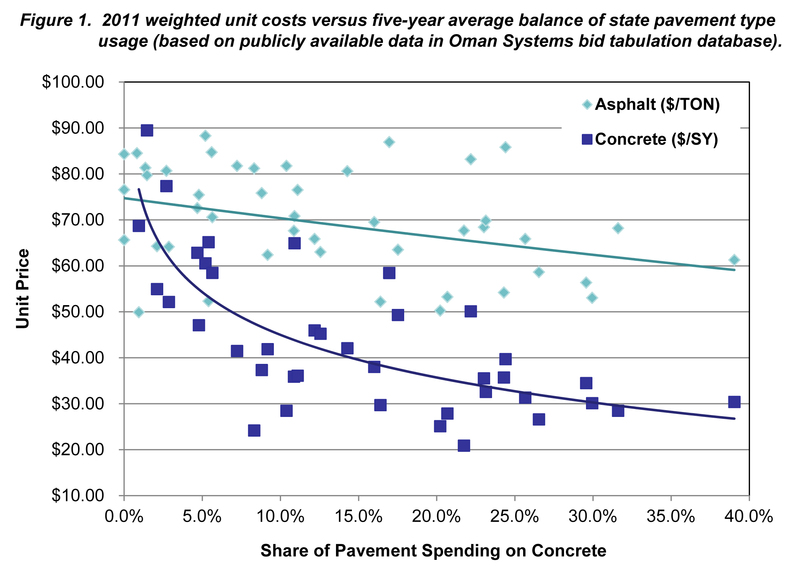 By allowing concrete to compete against asphalt, data shows that both concrete and asphalt pricing drops. Figure 1 shows how this has happened for roads and the same is true for parking lots. With the Geotechnical Report and CAD drawings we can return to you a full plan with a jointing pattern designed in accordance with ACI 330, Guide for the Design and Construction of Concrete Parking Lots. If the geotechnical report and CAD drawing are not available, we can work with what you have. By specifying concrete as the default with an asphalt alternate, you will encourage more bids. More bids mean more competition. More competition means lower costs. We ask for the concrete as a default, because asphalt bids will come no matter what. When concrete is buried in the plans, it is our experience that it is often overlooked. Let the market decide. You may be willing to pay more for a better pavement, or it may be all about initial costs. Either way, you can sit back and watch competition work to your benefit. No matter if your focus is life cycle costs or initial costs, increased competition will give you a savings you can bank on. Need more information? We also offer a detailed education program providing Professional Development Hours (PDH’s) showing how concrete can change the way you look at paving. Download our Concrete Parking Lot brochure here. While concrete has always made the most long-term sense, advances in concrete pavement design and placement, coupled with the rising cost of liquid asphalt, have made the initial costs of concrete about the same, often beating asphalt (See Figure 1). We offer ACI 330 design assistance. See the Frequently Asked Questions for more details. Because concrete parking lots are brighter and reduce lighting needs by about 30%, fewer lighting fixtures are needed, decreasing material and labor costs. Concrete paving equipment has come a long way over the years, including the advent of equipment like 3D laser screeds, which reduce crew size and increase production rates. The use of an integral curb placed at the same time as the parking lot eliminates the need for additional subcontractors and increases efficiency. Asphalt costs fluctuate enormously. Typically, labor and materials are quoted separately because asphalt costs can change so quickly. Despite a recession that has cut demand for asphalt, the prices of liquid asphalt are still more than double what they were five years ago and are only expected to rise as the economy improves. While the initial costs of asphalt and concrete are similar, there is no competition in terms of the long-term costs (See Figure 1, initial cost tab). In addition to the initial cost savings mentioned on the left page, concrete’s reflective surface decreases lighting energy up to 30%—a savings the owner can keep for the life of the project. Increased strength and durability means less maintenance, as concrete parking lots can last decades longer. The cooler, more reflective pavement decreases ambient temperatures by about 7 to 10 degrees, which slashes peak loads during those hot summer days. Right: This parking lot was given a concrete overlay of the old asphalt which considerably cooled the parking lot. By maximizing the use of fly ash and slag to replace Portland Cement, parking lots significantly increase the use value of the recycled content (LEED Materials and Resources Credit 4). Concrete’s strength often means less material is needed to do the same job. Increased strength leads to increased durability. While other materials might need constant replacement, concrete can last decades longer. Concrete’s strength usually means eliminating the need for subbase materials—and it also means you use less of it. In Figure 3, Structural Numbers are used to compare equivalent pavements, showing that 12 inches of an asphalt solution is equivalent to less than six inches of a concrete solution with the same Structural Number. Concrete’s reflectivity reduces the urban heat island effect (LEED Sustainable Sites Credit 7.1), which in turn cuts down the energy needed to light the parking area as well as cool a building on peak energy-demand days. The reflective surface also invites a safer environment, which is especially important for banks, retail and educational establishments. 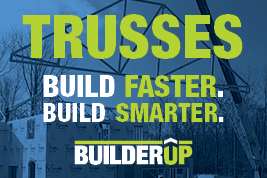 Concrete is made from raw materials that are often mined right here in Maryland, decreasing fuel and energy needed for transport and also feeding the local economy (LEED Materials and Resources Credit 5). Additionally, because wet concrete can only travel short distances, plants are local and support their local communities and economies. When concrete is finished with its long service life, it can be recycled. Alone, Chaney Enterprises processes more than 100 million pounds of recycled concrete each year. How can I get ACI 330 design help? What appearance/finish options are there? Concrete surfaces can be placed with an array of textures, shapes, patterns and colors. Virtually any style or finish you can dream of is possible. Chaney Enterprises offers an AIA class on decorative concrete to learn how to specify different options. How can I keep my surface clean? The better protected the surface, the easier it is to clean and maintain. Chaney Enterprises highly recommends the use of a quality surface sealer. How do I protect against freeze/thaw conditions? ACI 330.1-03, Specification for Unreinforced Concrete Parking Lots, recommends ACI air entrainment and 4,000 psi concrete in our climate. This, coupled with quality placement per ACI 330.1-03 specifications and a quality sealer, will increase your concrete’s resistance to external forces. How can I be sure I will get a quality end product? If followed, ACI 330.1-03, Specification for Unreinforced Concrete Parking Lots recommends ACI certified finishers with ACI testing of the concrete. For the subgrade, it recommends density testing per ASTM D698 or D1557. Are there ways to save even more? Roller Compacted Concrete (RCC) is an even more economical way to place concrete. This concrete does not have the same finish as traditional concrete, but it’s just as durable and offers significant cost savings. This is especially applicable in industrial settings.